The second anniversary of my April 22, 2013, stroke is almost here. The hemorrhagic stroke zapped the right-hemisphere components of my brain and nervous system that control left-side movement and the reception and processing of sensory input on my left side. 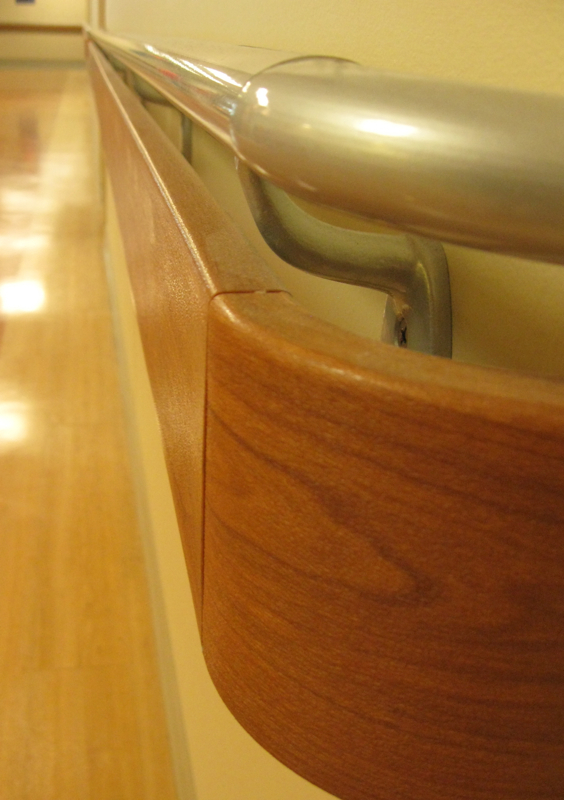 The railings pictured above are in an Ocean Springs Hospital hallway. They are similar to the ones in the Singing River Hospital Comprehensive Rehab Center. I spent 27 days there after I was discharged from the intensive care unit at the Ocean Springs Hospital. What a difference, though, in the way I used those railings then and how I use them now almost two years later. In the current stage of my recovery, such features allow me to lengthen my stride and to get moving with more confidence. Just touching them with the fingertips of my right hand gives me an additional sensory reference point. And that helps compensate for the sensory input that I now lack. My relationship with the railings during my 27-day stint in inpatient rehab didn’t begin until close to the end of my stay. The first priority was to work with me on retraining me in safe self-care such as showering and transferring from one surface to another, as from bed to wheelchair and wheelchair to potty. And all those things were challenging. When the day came to do more in the movement department, the staff wheeled me into the hallway and positioned my wheelchair where the railing would be next to my right hand once I stood up. I think there were two techs holding on to my gait belt, one behind me and one on my left. Somebody was lurking with the wheelchair. The physical therapist was on a low rolling stool where she used one hand to keep my left knee from collapsing and an elbow to shore up some other weak body part against collapse. My recollections are definitely a little fuzzy. What I remember clearly is the sheer terror. My left-side body parts no longer worked without conscious thought. Neither did they respond to my fierce concentration. Fear of falling and maybe dismay at the total lack of response from my body overwhelmed me. The therapist assured me they would not let me fall. I accepted that intellectually and finally managed some forward movement, but that didn't diminish my fear. I was slow to trust. Eventually holding on to the railing became part of several different walking exercises. In those early days “holding on” may have been too mild a phrase. Even later when I was in outpatient therapy, any nearby sturdy structure that resembled a railing tempted me to “cheat” on the assigned exercise and latch on with a left-handed death grip. The ultimate goal in those early walking attempts was to traverse 20 feet, about the length of the section between the two doors closest to the camera in the photo above. The therapist and techs celebrated every advance toward my reaching that goal. Now I can’t remember if I ever actually reached that 20-foot mark during my stay at the rehab center. I do remember, though, that the fear was slow to recede. Even though I was committed and determined, that didn’t keep fear from roaring back full force every time the therapists introduced a new walking exercise or environment. And that held true for outpatient rehab many months later. That terror hasn’t struck for over a year now. Much milder fears do surface in certain circumstances. I usually avoid stores jammed with breakables or extra narrow aisles. Walking in crowds of fast-moving people can also still raise my anxiety level. That is when my hiking stick comes in handy. When I use it, people see it and are usually careful not to bump me or dart across my path right in front of me. And it is not because I look like I’m going to bop them with that wooden stick. Most people react quickly to give me the space I need to maintain balance. I am thankful for such simple kindnesses that come my way every day. They help me maintain balance in the emotional and spiritual realm, too. I remember these days, I remember your husband posting what had happened to you, and how shocked I was. I am so glad you are through them at at the other end now! I learn a lot when I visit you here and I admire your spirit and your posts. Do you exercise in a warm water pool? Sometimes that is recommended. What an ordeal! I hope I never experience a stroke. My younger daughter is studying to be a physical therapist and she hopes to help many patients after she graduates. I am always so impressed with the courage you have displayed during your recovery. Being afraid, yet still attempting the difficult is true courage. You have come so far and while your journey is not over, those early days are. And hey,if anyone cuts you off, go ahead and whack them with your walking stick. you have certainly come a long way baby... and i do admire your courage and how hard you have worked to overcome. that is a beautiful halway, love the floors. we have railings like this in the nursing home and the people in wheel chairs use them to pull themselves along the hall, the ones who can't use their legs, but can use their arms. Your posts are always so full of new learning for all of us. I am amazed at your continued determination to heal. I am also amazed at how far you have come. Fear is one of the greatest obstacles I am sure. I find it to be so in my life. Thanks for showing us how you have achieved balance in all areas of life. I've grown to love railings. Our SIL installed a railing next to the front door which has proved a life saver. 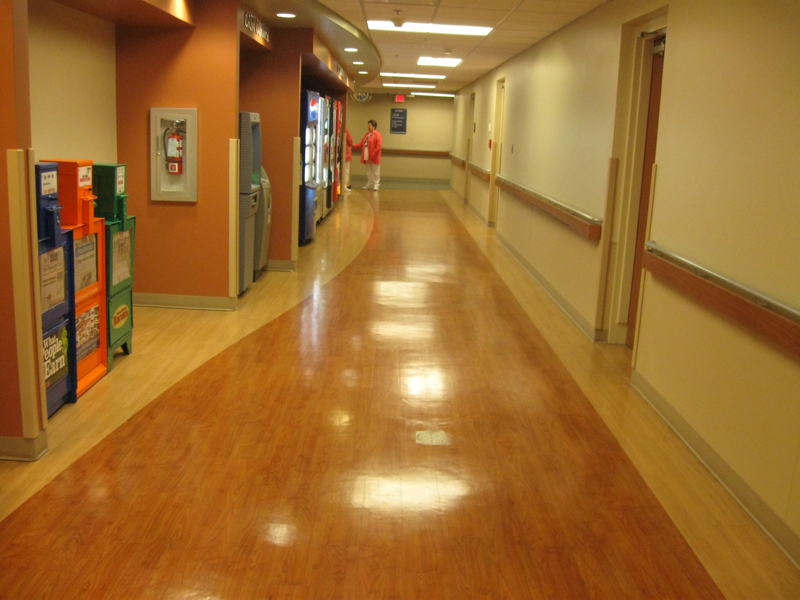 Fortunately, our hospitsl has placed those hand sanitizers at frequent intervals along its rails. Also life savers. I have posted before, but it continues to be an important facet of my recovery, thanks to all of you who have gone through this journey with me and chimed in with encouragement, humor and snippets of your own challenges, pleasures, and practical information. Terra, water exercises have not been suggested although my neuro therapy group does do pool therapy, mostly with children in the summertime. They used to all year round but higher ups evidently didn't include a pool in specifications and now unheated YMCA pool is only option. Gigi, Hooray for your daughter. Most neuro PT students I have met want to work with children. I hope she gives working with elders consideration. Dianne, EUWW! I never even thought of GERMS on those railings. I do, however, wash hands with real soap frequently. I am thankful that, so far, no ailments post-stroke. Ginny, Patti, Sandra, Sally, and all, each comment is a gift that brightens my way and renews my determination. Thanks. Your determination even in the face of fear is inspiring to me. You have come so far in 2 years. I applaud you! I have a couple of months till I will be marching around hallways again with my new hip. I love rails. :) You have done so well. Bravo for riding the cable cars. I love SF too. That's my favorite city everywhere. Love the signs too. So many here have been wiped out. They should have kept them. How far you've come in your post-stroke journey! It's hard to believe it's nearly been two years. I continue to pray for you on a regular basis. Wishing you the best, always, my friend.